From the best-selling author of Changeling Moon, this stirring novel of passion and magic launches an addictive new series for fans of paranormal romance. Enslaved for millennia by the masters of the Welsh faery realm, the fierce Celtic warrior Rhys is doomed to wander the earth forever. But when a brave beauty unwittingly breaks the enchantment, he is drawn into a strange new world…and an all-consuming desire. Sensible Morgan doesn’t believe in magic—until a mysterious being saves her from a fate worse than death, and life as she knows it changes forever. Now the man of her dreams has become flesh and blood, igniting a spark in Morgan’s soul which science cannot explain. But even a love that transcends time may not be strong enough to withstand the power of an ancient curse. Modern witch and magic-shop owner Brooke doesn’t think her life is missing anything, until a wayward enchantment lands a brooding medieval blacksmith in her spell room—and in her arms. Yet even after their passion proves to be truly magical, Aidan’s first commitment is to vengeance. Now Brooke must team up with friends and ancient warriors alike—and push her own powers to their limits—to save her love from the wrath of an evil fae. From the best-selling author of Changeling Moon, this thrilling and sensual novel adds a new chapter to Dani Harper’s Celtic folklore-themed Grim Series. Available in trade paperback, ebook and Audible. Dani Harper is a former newspaper editor whose passion for all things supernatural led her to a second career writing paranormal fiction. A longtime resident of the Canadian north and southeastern Alaska, Dani recently ventured south with her husband to rural Washington to be closer to their grown children. She is the author of Changeling Moon, Changeling Dream, and Changeling Dawn, as well as First Bite, a Dark Wolf Story, and Storm Warrior, the first book in the Grim Series. GRAND PRIZE: A signed paperback copy of STORM BOUND, an MP3-CD of STORM WARRIOR, a set of the LLEWELLYN TAROT cards, a Celtic-style blank journal, a Celtic symbol pendant (pewter), a pewter magnet of a “black dog” (mastiff), plus a Dani Harper tote bag and swag. RUNNERS UP: 10 runners up – Reader’s choice of a Kindle ebook from Dani’s backlist (Changeling Moon, Changeling Dream, Changeling Dawn, First Bite or Storm Warrior) Note – if you do not own a Kindle, Amazon provides a free app for your computer, iPad, or smartphone so you will be able to read this ebook. Dropping by to say Hi!, and thank you for hosting my Book Blast. I had a lot of fun putting together the giveaway and hope your readers enjoy entering it. :) Working on Book 3 right now! More books to read by an author I enjoy! What fantastic covers for a great series! Crossing my fingers that I win! ! Looking forward to this series. Thanks for the giveaway. Great covers. Love the excerpts and this series. 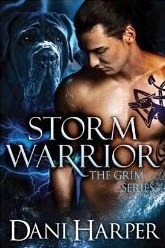 Truly loved Storm Warrior and can't wait to read Storm Bound.